Our No. 10 Window Envelope is made of top quality white 24lb. paper and can be used for any mailing application. Add a little advertising Mouse artwork to catch their attention or for advertising purposes. Size is 4 1/8 X 9 1/2. Size of Window is 1 1/8 X 4 1/2. Please choose ink color below. 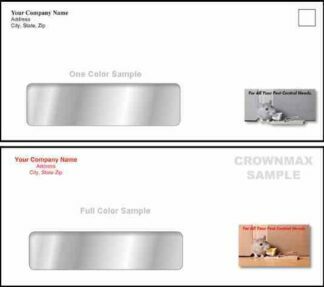 This envelope can also be printed in full color, see prices below and select FC pricing. *Self-seal envelopes are available. Check with customer service for difference in cost. 1-800-252-4011.